Potentate Mining was recently featured on the website of the Gemological Institute of America (GIA), in an article by Tao Hsu, Andrew Lucas, Shane McClure, Nathan Renfro, and Kevin Schumacher. The richness of Rock Creek along with its history and geology are highlighted, as well as Potentate’s operation and responsible sourcing. Visit the link below for the GIA website, where a video and several galleries are available. Of all the sapphire deposits found in Montana, the richest is in the Rock Creek (Gem Mountain) district. Between 1890 and the 1930s, over 65 tonnes of rough sapphire were recovered from this area and continuously supplied Switzerland’s watchmaking industry until the introduction of synthetic sapphire in the late 1930s. For the first time in the past 120 years, the rich sapphire-bearing land in this area is owned by a single entity. To witness the beginning of a new era of sapphire mining in Montana and gain a full understanding of this operation, a GIA team visited the new Rock Creek sapphire mine in early August. Sapphire was originally discovered in the Rock Creek area during gold exploration in the late 1800s, like many Montana sapphire deposits—gold mining was extremely popular in the area at the time. Since the climax of sapphire mining, boosted by demand from the watchmaking industry, local sapphire mining has largely supported the sapphire-oriented jewelry businesses in Philipsburg and the fee-paying sapphire hunters. Although the source rocks of alluvial sapphires in Montana have never been discovered, inclusions and geochemistry of material from this location may give clues to their original source. Mineral inclusions in alluvial Montana sapphires, mainly from Rock Creek, were identified and compared with existing data. Topaz was a remarkable find in one of these samples; other newly identified mineral inclusions in Montana sapphire were allanite, anatase, chalcopyrite, and monazite. Montana’s rich history of gold and sapphire goes back to the late 1800s. A GIA field team traveled to the Rock Creek and Missouri River areas, where sapphire mining is still underway, to document the current industry and collect rough sapphire samples for our research reference sample collection. During our time in Montana we visited three mining operations, each with its own business model and its own exciting story. This week Potentate Mining is in the spotlight on pages 12-13 of the latest edition of Gems & Jewellery, a publication of the Gemmological Association of Great Britain (GemA) – the oldest Gemmological Association in the world. Recently, Montana-based Potentate Mining LLC secured approximately 3,000 acres of sapphire-bearing ground covering the famous Rock Creek sapphire district, including the Gem Mountain sapphire mine, near Philipsburg, Montana. Since the discovery of these sapphire deposits in the 1890s, this is the first time that one company has consolidated such a large land position, encompassing the old alluvial sites as well as the area on the hills in between these old workings (figure 1). 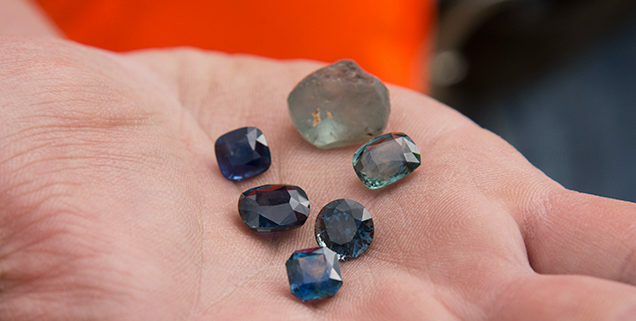 Potentate has assembled a team of highly experienced placer miners, geologists, mining engineers, and heavy equipment operators to recover and process the sapphires from this mine. InColor Magazine puts the spotlight on Potentate Mining in “A Rainbow of Sapphires”. Potentate Mining and our Rock Creek Sapphires are on centre stage in the latest edition of InColor, a publication of the International Colored Gemstone Association (ICA) representing an international membership of colored gemstone and jewelry dealers, wholesalers, miners, and gemmological laboratories around the world. The Director of Marketing – WFB is currently on the Board of Directors of the ICA. http://www.potentatemining.com/wp-content/uploads/2016/07/in.color_.magazine.jpg 1055 2000 Paul Gaudet /wp-content/uploads/2016/07/potentate.mining.rock_.creek_.sapphires.logo_.340x156.sm_.png Paul Gaudet2015-05-01 09:00:282016-08-03 20:58:25InColor Magazine puts the spotlight on Potentate Mining in "A Rainbow of Sapphires". By Barbara Wheat Lipatapantop, Dec 2014 – Potentate Mining is proud to be the focus of a tremendous article written by industry expert Barbara Wheat Lipatapanlop in her recent article “Mining Sapphires In Montana” for TNJ Colors magazine. Historic records found in the Montana Historical Society Archives show that production of sapphires from Rock Creek exceeds that of all other Montana sapphire districts combined (Berg, 2014). Sites include both alluvial and colluvial deposits, although the distinction between the two types of deposits can be somewhat arbitrary. © Copyright - Potentate Mining Ltd.